Our turf handles the toughest contact sports and still maintains a green and pristine appearance. The sky’s the limit with our synthetic sport turf capabilities! Whether it’s a home putting green, school playground or sports field, we have the perfect synthetic grass solution for the job. Get the quality green without the large water bill with TigerTurf™ U.S. synthetic putting greens. Our low-maintenance golf greens are a great option for any course, driving range, or office. TigerTurf™ U.S. synthetic golf greens roll speed, size and shape can be adjusted to any skill level for golfers of all calibers, beginner to professional. TigerTurf™ U.S.’s green speeds exceed the U.S. Golf Association’s championship standards and are an ideal alternative for any landscape. 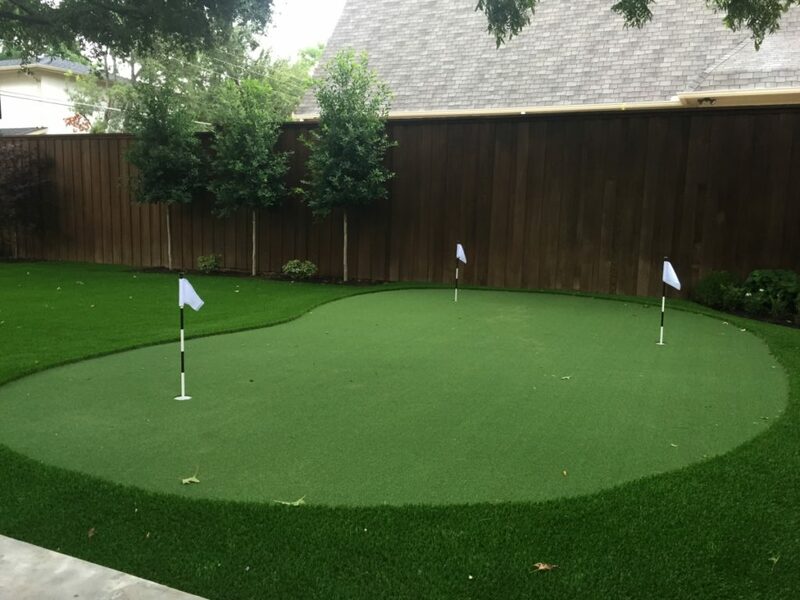 include all of the necessary accessories for synthetic golf greens experience, such as tiers, contours and bunkers along with flag sets, cups, even lighted holes to add a more authentic touch to the course or backyard of your dreams. Perfect your short game with our high quality synthetic putting green options. 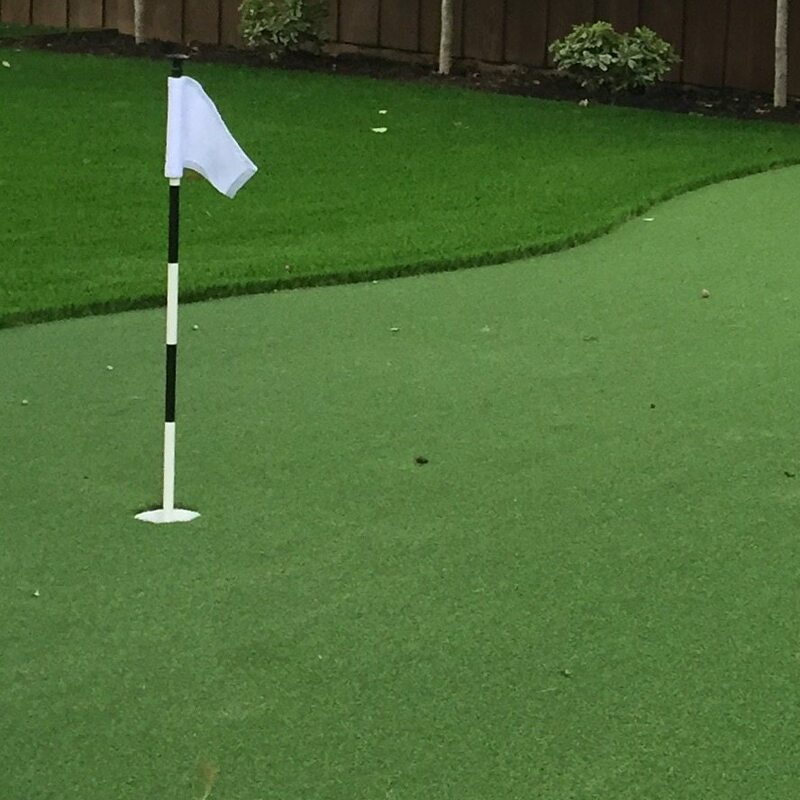 Our TigerTurf™ putting greens are virtually maintenance-free and will save you time and money. Forget about costly maintenance bills and take control of your golf experience with TigerTurf™ U.S. products! TigerTurf™ Play is our exclusive playground product, the perfect choice for children and students alike to fully enjoy the outdoors. Our multi-use, weather resistant playing surface is THE ideal outdoor solution for primary, intermediate, and high school landscapes. Children, students, and peers are significantly more apt to fully enjoying the outdoors when looking out into a sea of evergreen versus an ocean of concrete or asphalt. In addition to the obvious aesthetically pleasing aspects, TigerTurf™ Play was created to remain both lush and resilient year-round. Our product is the ideal solution to replace unappealing and unsafe grounds. When natural grass is trafficked for more than a few days out of the week or suffers unpleasant weather conditions, it is impossible for it to keep its vibrant color, springy texture and is prone to becoming jagged and eventually unsafe. TigerTurf™ Play will not only increase safety and ensure quality but will also significantly decrease the high cost of water and upkeep related bills. To schedule an appointment or receive an estimate. © 2018 Synthetic Grass ATX. All Rights Reserved. At Synthetic Grass ATX, we are the premiere synthetic grass installers of the greater Austin, Texas area. We have years of experience and are looking forward to working with you on your artificial turf project!